The period from August through mid-September marks the height of a six-month hurricane season in the North Atlantic. When hurricanes occur, most ships disperse to safer locations, leaving a void in data-collecting ability for meteorologists. That's when NASA, the National Oceanic and Atmospheric Administration (NOAA) and the National Weather Service (NWS) step in to gather information. But to monitor these storms and the winds that cause so much damage, these organizations need specialized tools. Tropical Rainfall Measuring Mission (TRMM) microwave imagers and Advanced Microwave Scanning Radiometers (AMSR-E) measure temperatures of ocean surface waters, which determine the direction a hurricane will travel and potential hurricane intensity. A floating buoy dropped from an airplane sends out a spool of wire to determine the water temperature and radios it back to the plane. 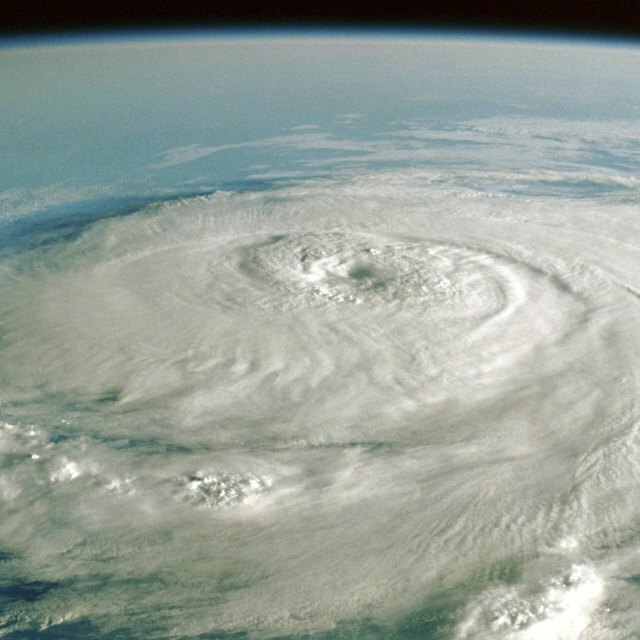 Scientist Vernon Dvorak developed a method for estimating hurricane strength by comparing satellite images with physical characteristics of the hurricane. This has become the basis for hurricane forecasting models used by meteorologists. NASA satellites collect hurricane data from space combined with computer-based climate mock-ups of sea surface temperatures, rain, wind and wave height. Buoys remain the last manmade structure in the waters in and near hurricanes, and because they don't travel, buoys are suitable for the attachment of weather measuring instrumentation. Buoys can measure wind and air pressure, water and air temperatures as well as wind direction with anemometers, and they can measure sustained wind speeds in one-minute increments. Hurricane reconnaissance airplanes fly into hurricanes to measure wind speeds and barometric pressure and visually inspect the ocean surface. Planes travel at altitudes of approximately 10,000 feet and calculate wind measured at 10 meters above sea level based on measurements at 10,000 feet. Dropsondes descend from the plane with a pint-sized parachute to measure wind speed, providing approximate wind readings closer to the water surface, but they only gather localized snapshots rather than sustained wind speed information. The Weather Channel: How Strong is that Hurricane? Dr. Steve Lyons. NOAA: Noaa Hurricane Hunter Remote Sensing Device Gets High Marks For Measuring Hurricane Sea Surface Wind. Jane Goldman. Whetzel, Joan. "Tools Used to Measure Hurricanes." Sciencing, https://sciencing.com/tools-used-measure-hurricanes-6862094.html. 13 March 2018. What Is the Difference Between AGL & MSL?